UP Scholarship Registration started on 1 July and the last date to fill the UP scholarship application form is 30 September for Pre-matric scholarship and 10 October for Post matric scholarship. The candidates can apply online for UP Scholarship Pre Matric, Post Matric and Post Matric other than intermediate from 1 July 2018. The direct link to apply online for UP Scholarship 2018 is available on this page. The candidates can fill the UP scholarship online form 2018 after checking the eligibility. Last year 1.3 crore candidates registered for UP Scholarships under Pre Matric and Post Matric Section. Also, the candidates can apply online for UP Scholarship Renewal. The link for UP Scholarship Renewal is available towards the end of this page. This page gives information on UP Scholarship Application form, Eligibility Criteria, Dates, steps to apply, UP Scholarship Renewal and other important details. Latest Update: UP Post Matric Scholarship Application date has been extended to 10 October. For Class 9 and 10, the date has been extended to 30 September. The notification for change in date was released on 10 September. UP Scholarship 2018-19 application process has started. The Direct Link to apply online for UP Scholarship is available on this page. As of 28 August 2018 almost 52 Lac (51,96,443) students had registered for the UP scholarship and out of them 20 Lac (2013215) students have filled up the application form and 82,331 application have been forwarded by the respective institutes. The candidates can apply online only for UP Scholarship Pre Matric and Post Matric. The last date to apply online is 30 September for Pre matric scholarship and 10 October for Post matric scholarship. The direct link to apply online for Pre Matric and Post Matric Scholarships are given below. The candidates are advised to apply online before the due date as there is a lot of traffic congestion on the last date and the students may or may not be able to apply. Step 1: Register Online: The candidates need to register first by following the link below. A registration number will be generated. The candidates are advised to note down that number for future correspondence. Step 2: Fill the online application form: The candidates now have to fill the online application form by following the link below. Before filling up the UP scholarship application form, the student should choose the right category and link to fill the application form. 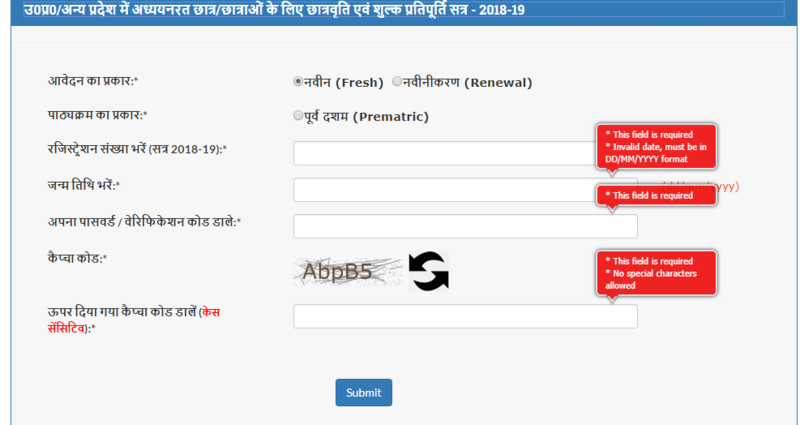 UP scholarship Application caste certificate number: The candidates have to enter the caste certificate number while filling up the application form. The candidates who are applying online for UP Scholarship 2018-19 need to fill the following details correctly in the scholarship form. The candidate is also advised to check all the detail before final submission. The candidates need to submit the following documents with UP online scholarship form. Note: All the certificates must be self-attested and thereafter the candidates need to submit to their respective school/institute who will forward it after verification to the respective official departments. The candidates need not send any documents to UP Government after completing the Online Application Process. The Application can only be submitted online, there is no offline application form. The candidates can check the status of their application using their Log-In Id and Password. The candidates need to fill Aadhar number which is mentioned in their Saving Account in the application form. The candidate must have filled "Know Your Customer" form in their respective bank. The candidates are advised to keep their Saving Account activate. The candidates need to maintain the limited required amount in their Bank Account. The upper limit of Saving Amount must be greater from the desired scholarship amount. After submitting the online application form, the candidates can check the status of their application form by log-in through their email id and password. The candidates who apply under Pre Matric and Post Matric Scholarship are only able to check their status. UP Scholarship reflects the details of the candidates, verification details etc. The candidates whose application is found suspicious will not be forwarded for the scholarship. The candidates can check it through their log-in and correct the data from 11 to 20 October 2018 for Pre Matric and 21 October to 1 November 2018 for Post Matric. The candidates seeking Renewal for UP Scholarship 2017-18 can apply online through the link below. The candidates need to log-in by entering the Registration number which generated at the time of registration in 2017-18, date of birth and mobile number. The candidates are advised to apply online under their respective category. In case of any query regarding UP Scholarship 2018-19 Application Form, you can write to us in the comment section below.